This past week The Line Media ran an article on Keyhubs. The story is nice, but more remarkable is the way in which we landed it. When you break it down and trace the moments that make an “event” like this happen, you begin to appreciate the finer, subtler things in life – namely, the magic of networking and the mystery of time and space. The Line writer, Elizabeth Millard, read about us in the Twin Cities Business Journal and expressed interest in writing a story as well. (The Business Journal article also led to the following write-up on my alma mater’s website). So, how did we land in the Twin Cities Business Journal? This is where the fun begins. I met the writer of the article, Kathy Grayson, about a year and half ago. After giving her my pitch, she politely asked who some of our local clients were. At that time, we didn’t really have any. She thanked me for my time and asked that I keep her posted on new (well known) clients that we engage with here in the Twin Cities. That was a fair and valid request. As months passed, I would update Kathy on our progress. I would email her whenever we secured a new project and I included her on my blog and news emails. Despite sending some personal follow up notes, I never heard back from Kathy….until I sent her the following video interview of Harold Hegg from Thrivent Financial. We were introduced to Harold by Chris Stewart, who heard about us via a student intern at Thrivent that was tasked with searching for social analytic software tools. Thrivent became a customer and I invited Harold to speak at an executive roundtable hosted by Diane Nettifee’s Magis Ventures. I met Diane through another contact, Annette Setterlund. Diane introduced me to Kristin Wiersma of Seraphim Communications. They specialize in telling corporate marketing stories through video and multimedia. When it came time for Harold’s roundtable event, I hired Seraphim to video the interview, so we could share it with the world. None of this would have happened if it were not for Annette Setterlund and I would not have met Annette if it were not for Keith Setterholm. I literally met Keith in passing at a Minnesota Organizational Development Network meeting in June of 2010. We exchanged business cards and he expressed interest in learning more about Keyhubs. A couple of months later he introduced me to John Vollum and after a few follow up meetings, they both brought me to their good friend and long-time colleague, Annette Setterlund. Through several degrees of separation, seemingly random connections and unpredictable relationships, the Keyhubs story found its way on to the desks and screens of hundreds, if not thousands of business people around Minneapolis, St. Paul and beyond. The press buzz we enjoy today really had its origins in a “chance” meeting with Keith Setterholm over 18 months ago. Note: Keith does not have a website and at the time of this writing he had one follower on Twitter. While the business world flocks to capture and leverage online Klout, let’s not forget that our most potent connections may be right in front of us. You never know where your link to “success” is going to come from — the dentist’s assistant, an old acquaintance or the person next door. The key is to treat all with the same level of respect, reverence and kindness. Is there a faster and better way to get media attention? Probably (although, I did hire a PR firm about 6 months ago to no avail). The press buzz came from good ‘ol fashioned, face-to-face networking and relationship building. And you know what? I have so thoroughly enjoyed the process of getting to know Keith, John, Annette, Diane, Kristin, Chris, Harold, Kathy and Elizabeth, that I wouldn’t trade those connections for a front page article in the Wall Street Journal. The beauty of relationships is they are not a one-time deal. They are not like a media frenzy that comes and goes. They are priceless gifts that keep on giving, now and into the future. What could be more valuable? I hope this story serves as yet another simple but powerful example of the potency of networking and the pricelessness of relationships. Do you have a networking tale of magic and mystery that has transformed your life or business? Share it with us in the comment section below or email me at vnarula[at]keyhubs.com. We would love to include your stories in a future blog post. 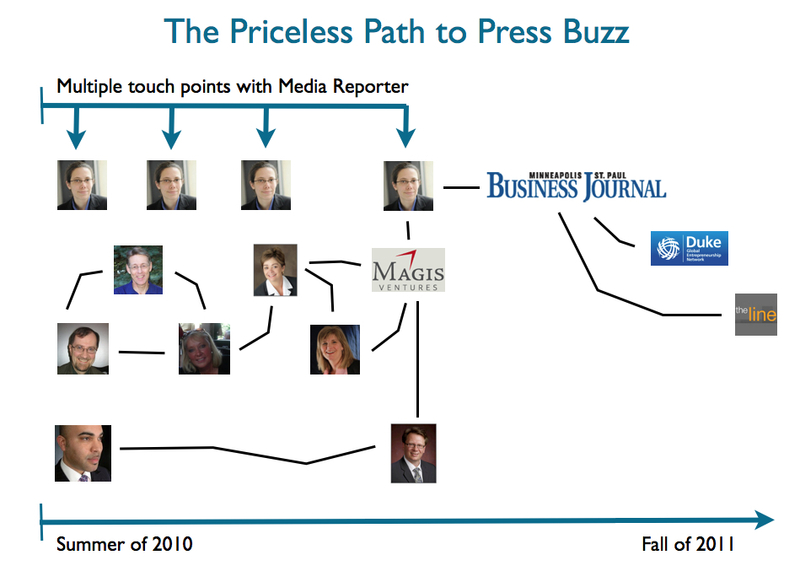 I love the graphic of the relationships that bought your company the buzz. Lots of us have similar stories but we never really think about how it all happened and the behaviors and actions that led to the success – and further how we can repeat what works. Thank you for taking the time to put this together. Great post! Thanks so much for the feedback Margaret — great to hear from you! Would love to hear your stories of networking magic.